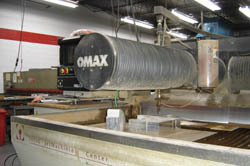 Waterjet cutting involves 40,000 to 48,500 psi water mixed with a sand/garnet material which is concentrated by a nozzle to cut a variety of materials. Our capability allows the cutting of materials such as copper, brass, wood, stainless steel, hardened tool steel, steels, plastics, rubber, glass, aluminum, etc. Thicknesses up to 6 inches and a maximum part size of 50” x 100” are possible. Because Waterjet Cutting is a cold-cutting process, there are no distortion or heat-affected zones. 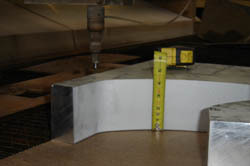 A +/- .005 tolerance can be held with a minimum kerf width of .030. To quote your exact requirements, please email your DXF/DWG file for a prompt response.